MANILA, Philippines – With the group elimination rounds in FIBA Asia 2015 now over, Gilas Pilipinas has finally found rhythm after dismantling Hong Kong yesterday and ousting Kuwait, 110-64, on Friday, September 25 in Changsa – Hunan, China. Coach Tab Baldwin admitted that his squad underestimated the lower-ranked Palestine at the opening day of the tournament that resulted into a sorry loss and should not be the same case when they face Kuwait. It was a no-mercy ball game for the Pinoy Cagers against Hong Kong where majority of their outside shots went in and gave them a 51-point very convincing win. Jason Castro who erupted for 21 points with 5 triples was really looking forward to hitting every mark at their last game of the eliminations and move on to the next round. Kuwait opened the game with a mid-range jumper from Yosiff Borhamah but Jason Castro and Ranidel de Ocampo quickly drained successive three-pointers for the lead. Losing 2 games in a row, the Kuwaitis looked solid from the outside as Yosiff Borhamah and Abdullah Alsaeid contributed most of their team’s digits early in the opening period. But they were really no match against the speed of the Filipinos who provided them damages in the middle off transition. Full court press and zone defenses imposed lots of trouble for the Kuwaitis offensively. Defensive stops seemed to be problems as well for team Kuwait as they hit their foul limit with 5 more minutes remaining in the first and most the fouls were hard enough to send Marc Pingris and Calvin Abueva on the floor. Scoring drought hit Kuwait for almost 6 minutes and they got stuck on 11 points against Philippines’ early 20+ point lead. Terrence Romeo who was really cold in the past 2 games finished the quarter with a fast break layup assisted by fellow new-comer Calvin Abueva. Gilas took a quarter breather with a 34-11 comfortable lead. Coach Baldwin started the 2nd period with his 1st unit on the bench and let Asi Taulava and Marc Pingris crashed boards. 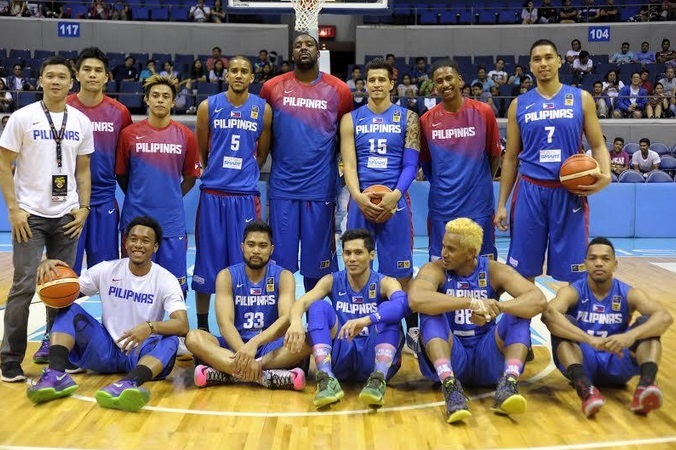 The only problem with the Gilas Veterans was their free throw shooting. Pingris for an instance, missed 4 foul shots while Taulava and Romeo wasted 3 and 1 respectively. After being scoreless for more than 10 minutes, Kuwait finally made a basket and added 2 markers to their 13 total points against Philippines’ 46 with 5 more minutes remaining in the first half. Yosiff Borhamah and Abu Dhom came alive as they buried 3 combined triples that resulted into a mandatory timeout called by Coach Tab Baldwin. Learning the ultimate lesson from their sore loss against Palestine, Tab Baldwin brought his starting unit back to protect their double-digit lead. But Kuwait’s Abu Dhom was still punishing Gilas for their lame defense in the rainbow territory. Ranidel de Ocampo closed the half with a buzzer beater jumper. Gilas with a commanding 55-27 lead. Jason Castro and another veteran, Dondon Hontiveros opened the 2nd half with flawless shooting. Andray Blatche surprisingly made his 6th point, eight all in all at the 7:30 mark of the third period. Sonny Thoss was the last player fielded in by Coach Baldwin, introduced himself to the rugged Kuwaitis with 4 quick points under the rim. Philippines grabbed its biggest lead of the game, 77-34. Abdul Alhamidi single handedly carried his team on his shoulders in the entire 3rd period backed up by Abu Dhom in his favorite spot of the floor in the dying seconds. Philippines was still up 87-48 entering the final canto of the game. It was not a good start for Gilas in the 4th as they gave Kuwait a small room to recover and trim down the lead. Luckily, Terrence Romeo and Matt Ganuelas-Rosser stepped-up the gas pedal and brought the 40-point lead back. Romeo, played his best game yet in the past 3 games. Romeo hit his 19th point of the game with a three-pointer. Philippines for the second time reached the 100th scoring mark. Gilas was still up, 102-60 midway of the 4th. With a strong 40+ point lead, Coach Baldwin tried to do an experiment in player rotation. He intentionally benched Andray Blatche in the entire 4th period and fielded in his undersized big men Asi Taulava and Ranidel de Ocampo joined by Matt Ganuelas – Rosser on the 3 position. It seemed working, while his tallest guy was resting, his troops enjoyed and maintained their big margin. Commotion happened with less than a minute remaining in the game. Ranidel de Ocampo inadvertently hit Abdul Alhamidi in the lip but got no call from the referee. Alhamidi confronted the referee and acted to attack him. The whole Kuwaiti bench restrained their furious teammate who really wanted to hurt the official. Alhamidi was thrown out of the game but before leaving the floor, he threw a bottle of water and hit a camera man. Ganuelas-Rosser hit the technical free throws and rested the ball until it expired. Gilas Pilipinas wrapped up the elimination round with a 110-64 win over Kuwait. Philippines will still have a chance to top its group if Hong Kong beats Palestine tonight.